As a professional keynote speaker, my presentations contain a myriad of real-world examples of ideas I’ve brought to life (and the lessons learned from doing so) to show how blue chip companies, organisations and entrepreneurs can implement innovation, creativity and left-field marketing in order to achieve wondrous success. There’s nothing more fulfilling and exciting than watching an idea from your mind come to life in glorious reality, and then it’s even more thrilling if that idea then engages with people, entertains them or even (on the rare occasion!) brings in revenue. Well, maybe there’s a couple of things that come close to bringing that kind of thrill, but hey, this is a family site! These days, it’s easier than ever to find experts to help you build a product prototype, and once you’re happy with your prototype, and perhaps you’ve landed some concrete pre-orders too (something I’d strongly recommended before you order a first run from a factory, so that you can be sure you’ll sell what you make and not end up with load of boxes of stock sitting in your home for ages, like I have many times! ), you can then source a factory to make your product using amazing resources like Alibaba. During the writing of this blog, I called Ad to ask why he suggested the idea of a grater called ‘Let’s Make It Grate Again’, and he told me, “Whenever you do something Shed, it makes me come up with puns. And of course, the famous comedian John Cleese once said that the three rules of comedy were: ‘No puns, no puns, no puns!’, but actually, people have a great reaction to your ideas and puns, Shed…’. I laughed and replied, “Yes, perhaps puns are the lowest form of wit Ad, even lower than sarcasm if that’s possible! And yet I’ve based much of my career on puns!“. We laughed about that and Ad told me that he loved what I do – that sort of boost from supporters and lovely people gives me the drive and energy to carry on creating. 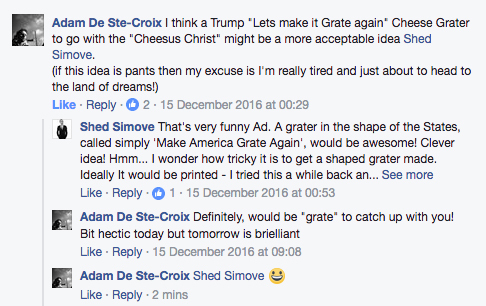 Now, as you can read from the above screenshot, when I read Ad’s idea, my immediate thought was that a ‘Make America Grate Again’ grater should be a grater in the shape of America. But, as you know, ideas always evolve, and that’s partly why they’re so exciting to bring to life, because they morph and develop in marvelous, surprising ways. As I thought about the idea more, I began to ruminate that maybe, instead of the ‘Make America Grate Again’ grater being a grater in the shape of the United States (which would involve a whole new cutting tool in the factory) an easier and faster solution might be to simply print the outline map of America onto an existing grater design. To me, the finished item just didn’t quite work well enough. I wondered if it the core ‘joke’ was easily communicated. So, I never produced that item. But as in all ‘failures’ what you learned during the ‘failure’ always helps you achieve further success. The experience of printing that grater was now directly and helpfully relevant to my making my new ‘Make America Grate Again’ grater. And I was still developing my thoughts about how it should end up looking. I started to think that rather than making the grater in the shape of America or even print it with the map of The States, maybe it should have the title of the item on the grater itself, with a picture of Donald Trump printed on it too, given he’s the man who made the phrase so famous. Then, the joke would be instantly understandable and self contained, plus I’d also have a fun dig at Washington and The President by bringing this idea to life too. Boom. So, with the final concept firmly formed in my brain, I needed a prototype. 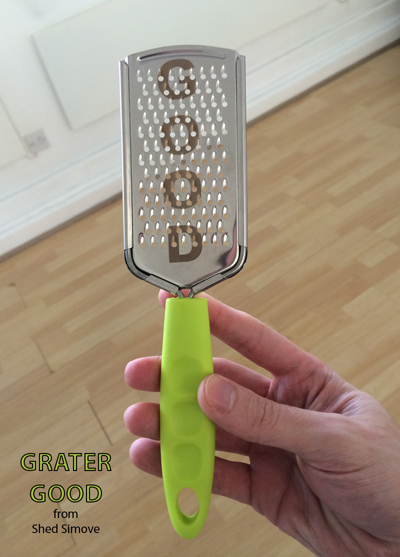 I quickly designed the graphic that I wanted printed onto the grater, then set about finding a grater to print it on. It took a surprisingly long time to source the right grater. It needed to have holes that were close enough, so that my design would then show well on the grater. I bought five graters, some plastic, most metal, and only one of which, a nutmeg, garlic, wasabi and ginger grater, turned out to be perfect. Next, there was the challenge of getting my design onto the metal so that it wouldn’t rub off – and was still hygienic to use with food. I presumed we’d need to laser etch the design onto the metal grater and so I turned to the geniuses at Original Monkey, a fabulous firm who create personalised gifts and signs – and who I’d worked with on my previous creation, Google Glass. I read this and thought it might be something for you. 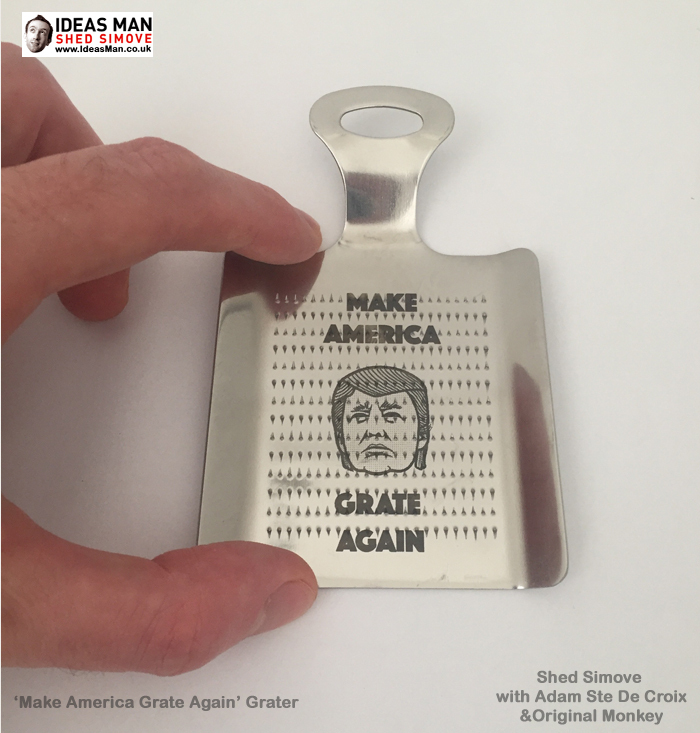 The post is called ‘Make America Grate Again’ Grater Dares To Take On Trump’s Nutty Side and is located at https://motivationalspeaker.biz/make-america-grate-grater-dares-take-trumps-nutty-side/.